Finding the perfect gift can be difficult. But we have the perfect gift idea: Smartwool socks! Buy three, and get the fourth FREE. Lifestyle socks. Ski socks. Biking socks. Running socks. Kids socks. Choose from thousands. We’re not kidding. Bright colors, fun patterns, lots of padding, a little padding. What they all have in common is merino wool. 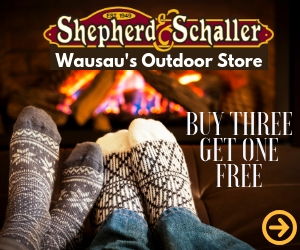 Visit us in Downtown Wausau and we’ll tell you all about the special sheep and special construction that makes these socks so smart. Mix and match and take the fourth home free when you buy three. Sale ends — never! We always offer Buy 3 Get 1 Free. But selection is best through the holidays. Smartwool prides themselves in making products you will love, and that will support all of your adventures. Their socks are made from ethically sourced merino wool. Merino wool is popular because of its warmth relative to weight. Not only do Smartwool socks serve their purpose and function, but they also feel great as well. Each fiber naturally helps regulate body temperature, transports sweat away as a vapor, and cancels out odors (they tested it themselves). Once you’ve tried Smartwool socks, you may not want any other type of sock on your feet! Stop by Shepherd and Schaller to shop our hundreds of Smartwool options!